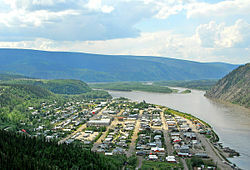 The Town of the City of Dawson or Dawson City is a town in Yukon, Canada. The population was 1,319 at the 2011 census. The townsite was founded by Joseph Ladue and named in January 1897 after noted Canadian geologist George M. Dawson, who had explored and mapped the region in 1887. It served as Yukon's capital from the territory's founding in 1898 until 1952, when the seat was moved to Whitehorse. Dawson has a much longer history, however, as an important harvest area used for millennia by the Hän-speaking people of the Tr’ondëk Hwëch’in and their forebears. The heart of their homeland was Tr'ochëk, a fishing camp at the confluence of the Klondike River and Yukon River, now a National Historic Site of Canada. This site was also an important summer gathering spot and a base for moose-hunting on the Klondike Valley. In 1978, another kind of buried treasure was discovered when a construction excavation inadvertently found a forgotten collection of more than 500 discarded films of fragile nitrate filmstock from the early 20th century that were buried in and preserved in the permafrost. This historical find was moved south to Library and Archives Canada and the U.S. Library of Congress for both transfer to safety filmstock and storage. 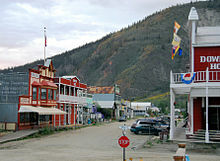 The City of Dawson and the nearby ghost town of Forty Mile are featured prominently in the novels and short stories of American author Jack London, including The Call of the Wild. London lived in the Dawson area from October 1897 to June 1898. Other notable writers who lived in and wrote of Dawson City include Robert Service and Pierre Burton. The childhood home of the latter is now used as a retreat for professional writers. Dawson City lies on the Tintina Fault. This fault line has created the Tintina Trench and continues eastward for several hundred kilometres. Erosional remnants of lava flows form outcrops immediately north and west of Dawson City. The last dredge shut down in 1966, and the hydroelectric facility, at North Fork, was closed when the City of Dawson declined an offer to purchase it. Since then, placer miners have returned to the status of being the primary mining operators in the region. The Downtown Hotel at Second Avenue and Queen Street has garnered media attention for its unusual Sourtoe Cocktail, which features a real mummified human toe. Bonanza Creek has two National Historic Sites; the Discovery Claim and the No. 4 Dredge. Every February, Dawson City acts as the halfway mark for the Yukon Quest International Sled Dog Race. Mushers entered in the event have a mandatory 36-hour layover in Dawson City while getting their rest and preparing for the second half of the world’s toughest sled dog race. Airports: Dawson City Airport, located 8 nautical miles (15 km; 9.2 mi) east of the town, has a 5,000 ft (1,524 m) gravel runway. Dawson City Water Aerodrome is located next to the community on the Yukon River. Both are classified as an airport of entry and, as such, can handle aircraft with up to 30 passengers. The water aerodrome is one of only two in Canada that that is able to handle aircraft with more than 15 passengers. 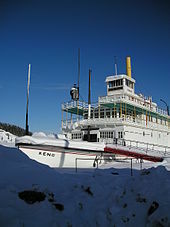 Winter transportation: During the winter, Dawson City is accessible via snowmachine or dog sled. The Yukon Quest sled dog race uses Dawson as the midway point of its competition in February. Robert W. Service known as The Bard of the Yukon for his famous poems "The Shooting of Dan McGrew", "The Cremation of Sam McGee" and many others which depicted the Gold Rush and the culture of the Klondike. Robert Service was transferred to the Dawson branch of the Canadian Bank of Commerce in Dawson City in 1908. Then, he dwelt in a log cabin where he would pursue his writings with The Trail of 98. Dawson City is home of the Berton House Writers' Retreat program, housing established Canadian writers for four three-month get-away-from-it-all subsidized residencies each year. Berton House was the childhood home of popular-history writer Pierre Berton. The program is now administered by the Writers' Trust of Canada. 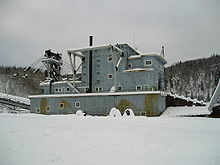 Pierre Berton narrated the 1957 film City of Gold which describes the excitement of Dawson City during the gold rush. Pierre Berton also wrote the book Klondike, a historical account of the gold rush to the Klondike 1896–1899. The cabin that housed writer Jack London during his time in the town is now just up the street. The London cabin was originally on Henderson Creek, a tributary of the Stewart River where Mr. London spent part of the winter 1897–1898. 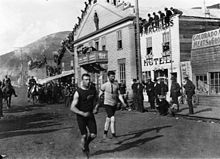 Dawson City was the starting place of impresario Alexander Pantages. He opened a small theatre to serve the city. Soon, however, his activities expanded and the thrifty Greek went on and became one of America's greatest theatre and movie tycoons. Jan Eskymo Welzl was an Moravian origin adventurer, hunter, gold-digger, Eskimo chief and Chief Justice on island New Siberia and later story-teller and writer. During his life in Dawson City he was called Perpetual Motion Man and also known as inventor. Bookes based on his stories were published in many countries over the world. Buried in Dawson City. Martha Black, the second woman elected to the Canadian House of Commons, as a single mother in Dawson earned a living by staking gold mining claims and running a sawmill and a gold ore-crushing plant. She later married George Black, Commissioner of Yukon, and in 1935 was elected to the House of Commons for the riding of Yukon as an Independent Conservative taking the place of her ill husband. In fiction, Scrooge McDuck came to Dawson in his quest for gold. He became known as the "King of Klondike" in the city. ^ "Paris of the North". 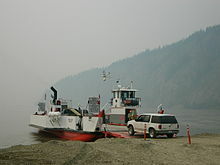 City of Dawson. Retrieved 2015. ^ a b c d "Census Profile". statcan.gc.ca. 6 May 2015. Retrieved 25 September 2015. ^ a b Coates, K.; Morrison, W. R. (1991). "The American Rampant: Reflections on the Impact of United States Troops in Allied Countries during World War II". Journal of World History 2 (2): 201–221. JSTOR 20078500. ^ "Dawson". Canadian Climate Data. Environment Canada. Retrieved 14 May 2016. ^ "Dawson 2". Canadian Climate Data. Environment Canada. Retrieved 14 May 2016. ^ "Diamond Tooth Gertie's". City of Dawson.